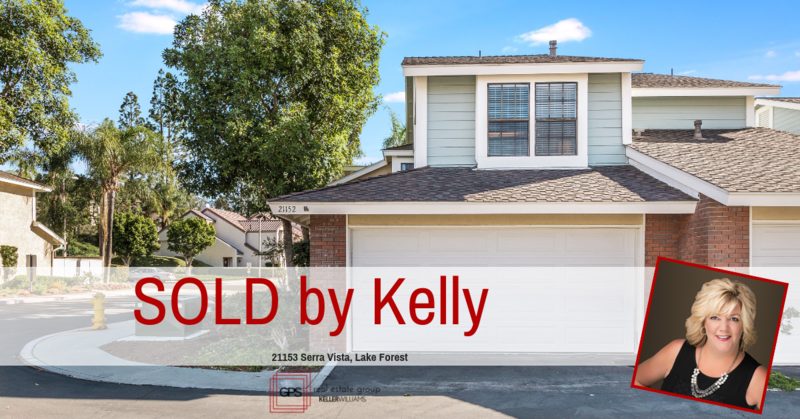 So excited for our clients at 21152 Serra Vista in Lake Forest as we just closed Escrow on their home in the Hillview Community of Lake Forest. It’s hard to find a 2 Master Suite Townhome this size in Orange County, especially one that includes a 2 Car Attached Garage and a Huge Yard. Did we mention it’s a End-Unit with only 1 neighbor attached. Truly the best location in the community! Recently upgraded with High Grade Wood Laminate Flooring, New Baseboards and on trend fresh paint. Light, Bright with Vaulted Ceilings help to make this living space a rare gem. In addition, you are going to love the spacious Kitchen with Corian Counters and Modern Maple Cabinets. You can decide if you want to have a quick meal in the kitchen or if you have friends coming over, plan a perfect dinner party in the separate dining area. Upstairs are the 2 Master En-suites with plenty of storage space and the wood flooring carried throughout. Need more storage space, then this garage is perfect for you. You’ll also appreciate the new energy efficient HVAC system and dishwasher. The Serano/Hillview Association Amenities includes: Pool, Spa, Clubhouse, Tennis Courts, Tot-Lot and BBQ area and directly next to Tamarisk Park. Located between Lake Forest and Bake, off of Trabuco, providing you easy access to the 405/5 fwy and minutes from the Irvine. Without having to pay Irvine prices. No Mello Roos, Low Tax rate. Make sure to check out the sold comparables!